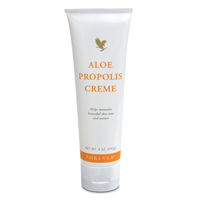 Who but Forever Living Products could produce a moisturizer as unique as Aloe Propolis Creme™? Combining our world leadership in Aloe Vera and beehive products, Aloe Propolis Creme™ is one of our most popular skin care products. Excellent as a skin moisturizer and conditioner, Aloe Propolis Creme™ is a rich blend of stabilized Aloe Vera leaf juice and Bee Propolis, with other ingredients recognized for their contribution to healthy skin. Chamomile, one of nature’s best-known skin care herbs, is also added to the mix. Vitamins A and E complete the formula, recognized for their natural skin-conditioning properties. Reach for Aloe Propolis Creme™ to help maintain a healthy skin tone and texture!